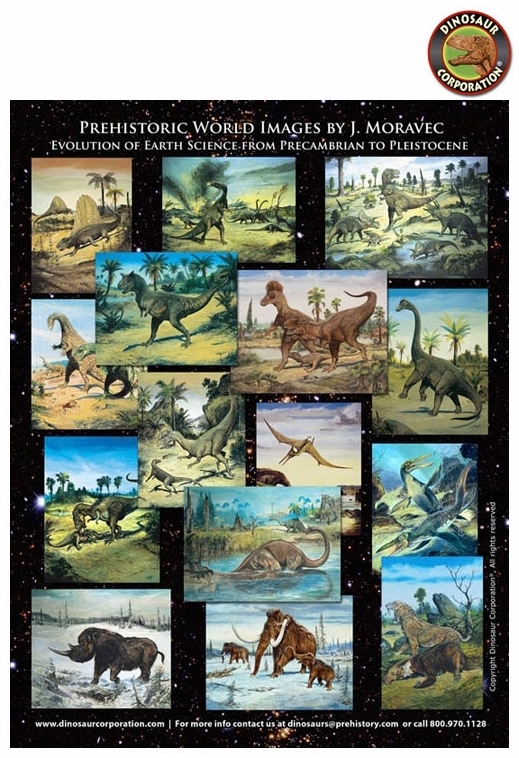 Dinosaur Exhibit of Cretaceous and Jurassic World by paleo-artist Josef Moravec. Unique quality reproduction from original oil painting on HD Aluminum metal dynamic artistic prints where specialty dyes are fused into coated aluminum panels offering brilliant natural colors and sustainable art preservation. Made in USA. Jurassic marine reptiles Stenopterygius and Kronosaurus, Permian Dimetrodon, Cretaceous dinosaurs such as Tyrannosaurus rex, Triceratops, Parasaurolophus, Tarbosaurus, Ceratosaurus, Jurassic Stegosaurus, Anatosaurus, Carnotaurus, Dilophosaurus, Diplodocus, Brachiosaurus, Allosaurus, Anatosaurus, Gallimimus, prehistoric reptiles Rhamphorhynchus and Pteranodon. * 10 oil paintings in reproduction on HD Aluminum Metallic Framed Prints. * Exhibit size: 80 linear ft / 120 sq. ft. The exhibit is now available to museums, schools, discovery centers and libraries in US and Canada in 2018. Available at wholesale: dinosaur toys, dig kits, T-shirts, models, woodcraft puzzles, fossil replicas teeth, claws to fill up your museum gift store during the exhibit.